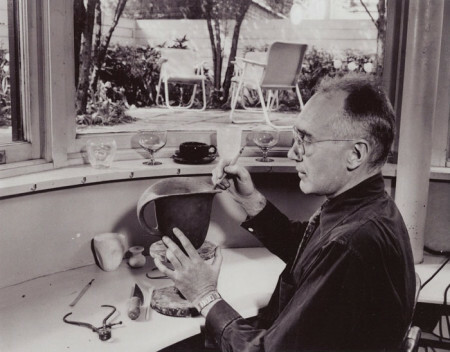 Russel Wright in his studio in 1950. When we sit down at the dinner table, we don’t really think about who designed the tableware – the plates, bowls and serving pieces. Chances are you purchased the table settings you use today based primarily on size, color and pattern. But as with every piece of decor in the home, a designer or group of designers put years of hard work into determining the exact size, shape, material and coloring of that which presents our food. Russel Wright was an Industrial designer from the late 1920s through the 1960s, and he played a major role in introducing modern design to the average household. From 1927 through the late ’60s he designed furniture, vases, home decor, serveware and tableware. He worked with several types of material – wood, spun aluminum, silver, ceramic, glass, plastic, pewter and melamine. He also designed a line of textiles. Wright was born April 3, 1904. He married Mary Small Einstein – a designer and sculptor, in 1927. Together the Wrights formed Wright Accessories, a home accessories design business, and began creating unique items like cast metal animals. 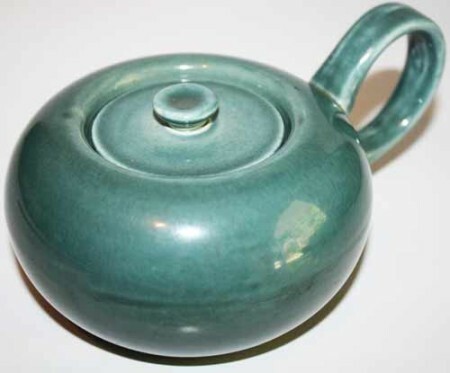 A Steubenville produced American Modern sugar bowl in seafoam green. In 1939, Wright’s line of ceramic dinnerware, American Modern, was introduced by Steubenville Pottery out of Ohio. The line remained in production until 1959, and is reportedly the most widely sold dinnerware in history. The original colors of American Modern were Seafoam Blue, Coral, Bean Brown, Chartreuse, Grey and White. Additional colors were Cedar Green, Glacier Blue, Black Chutney and Cantaloupe. The attraction of the dinnerware was that it was totally modern with no adornments. However, they were made of earthenware, which made them quite fragile. A future line, Casual, was made of high-fired china by Iroquois (New York). In 2009, Bauer Pottery re-introduced the American Modern line in the original colors. While American Modern is Wright’s best-known line, his work with melamine (Melmac) earned him the Museum of Modern Art Good Design Award in 1953. Wright’s Residential line was introduced in ’53. The line – unique in shapes, colors, weight and durability – helped ease consumers into using the plastic in the home. Wright also played a key role in promoting melamine for commercial use, but years-long legal battles resulted in a manufacturer stripping his name from the molds. Wright also designed a translucent melamine line called Flair which was produced by Northern in 1959. This line was heavier and more elegant, but was short-lived due to Northern’s financial problems that started a year later. 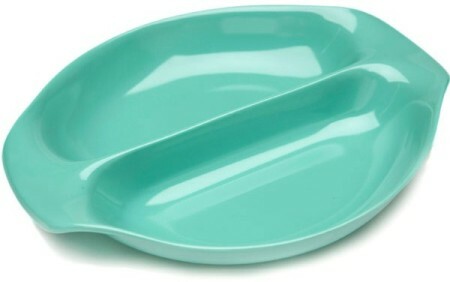 Russel Wright Residential Line’s reissue of the divided vegetable bowl in aqua. Today, one can find low-end melamine tableware in many department stores. Those wanting a true taste of the ’50s, including high-end quality, will appreciate the re-issue of the Residential line. Available in fantastic colors like lemon and aqua, the line features some of his most popular pieces, including cups and saucers, covered and divided vegetable blows, tumblers, platters and soup bowls. In 1950, Mary and Russel Wright’s Guide to Easier Living was published, teaching readers how to use efficient design to decrease housework and increase leisure time. It was reprinted in 2003, and provides a great look back at their hopeful projections for the future. Mary Wright died in 1952, leaving her husband to raise their adopted daughter, Annie. Wright retired to his 75-acre estate, Manitoga, in Garrison, New York. There, he built an eco-sensitive Modernist home and a studio he named Dragon Rock. Surrounded by woodland gardens, Dragon Rock is on the National Register of Historic Places and is a designated National Historic Landmark. Wright continued designing for many companies through the late ’60s. He died December 21, 1976. Today, his daughter oversees all operations and licensing of his lifelong works. American Modern Celery Tray: 13″ long, 3.25″ wide and 1″ deep. Wright’s goal was to design for easy and informal living. He believed that the dinner table was the center of the home, and thus tailored his pieces around larger furniture for family gatherings. A study of his works shows his true brilliance and impact on modern living. Want to learn more about Russel Wright’s designs and life? Be sure to visit Retro Chalet for a vast history. You can also tour Manitoga during your next New York trip.